Every once in a while the specter of a merger between Baltimore City and Baltimore County is raised and a shudder goes through the region and then the matter remains buried again. The Abell Foundation's latest report on three successful city-county mergers in Louisville, Kentucky, Indianapolis, Indiana and Nashville, Tennessee found no mention in the bigger media, only the Baltimore Fishbowl wrote an article and WYPR made it the topic of half of its Midday show on Monday. I was invited to discuss mergers with Jeff Wachter, one of the study authors. His report shows that each of the cases he investigated yielded benefits for both sides, the former cities and their counties. 2019 Abell Report: "An Inquiry"
The lack of interest in the new study is surprising because the fiscal difficulties of Baltimore County are all over the news and could provide an interesting new twist to the merger discussion: What if the usual assumption, that a merger would be a bonanza for the City and a bane for the County is wrong? What if the beneficiary of a merger wouldn't be the City but the County? What if, in the long run, at least, the County has less of a fiscal perspective than the City? 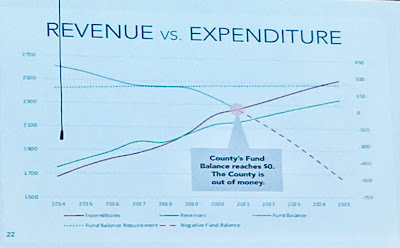 How such a reverse scenario could come about was, in part, the topic of my recent article about the County fiscal woes which pointed to the major reasons why County expenses rise and County revenues decline. (Fiscal realities are hitting home in Baltimore County). To a great extent, with growth slowing and the infrastructure aging, the County is now facing the same problems that the City has faced for many years. Running out of space for new greenfield development and being fleeced by adjacent counties with more development space left, the County now has to retool its revenue base in much the same way as the City has done so for decades. What's in the toolbox? The lack of interest in the merger report is also surprising, because much of the subtext of the past Baltimore City-County relationship has been based on race. One can suspect that much of the aversion of even thinking about a merger is still racially tainted. In a time when working through the legacy of race discrimination has become a daily topic from monuments to black-face, one would think that the loaded issue of City-County relations should be no exception. In spite of the changed demographic, fiscal and political realities, which even challenges traditional assumptions about who would win or loose, a merger of City and County following the model of the cities in the Abell study, still seems to be a political third rail and not very likely to happen. Hence the widespread shrugging of shoulders when the topic comes up again. But make no mistake, the winds have changed significantly: Neither is the County any longer free of the ills that plagued the City for so long (sinking property values, sinking student achievements, higher poverty) nor, looking further in the future, is the City so much worse off than the County. In fact, the City has enjoyed a healthy influx of young new talent, an increase in its tax base and a slew of new development and jobs (even though, by the numbers population still shrank slightly). The three new Democratic Executives in the counties surrounding the City (Baltimore County, Anne Arundel County and Howard County) all indicated that they intend to work much more closely with Baltimore's Mayor. Olszewski, Ball and Pittman realize that they share many issues because they know no boundaries, from water and sewer, to transportation and crime. 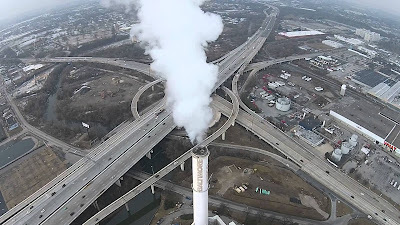 Baltimore City's recent vote for cleaner air, potentially forcing the incinerator out of business, would have an impact on all the jurisdictions, especially Baltimore County which incinerates as much waste as the City. The ever growing Port of Baltimore is planning to expand into Tradepoint Atlantic in Baltimore County. All Counties share the City's interest in resolving the East Coast freight bottleneck of the low tunnel under Howard Street which doesn't all double stacking containers. All are affected by the ancient B&P tunnel under West Baltimore which forces all "high speed" Acela trains to crawl through at 30mph. Regional collaboration in our area has a long history. It started a 100 years years ago when the region's juridisctions built the current water delivery and distribution system. Today Baltimore City’s Department of Public Works provides drinking water to 1.8 million people daily throughout Baltimore City and parts of Baltimore County and portions of Anne Arundel, Carroll, Harford and Howard Counties. The three reservoirs treatment centers are regional in reach. Interestingly, Baltimore County managed to charge its residents lower rates than Baltimore City, an inequity which won't work any longer. The County's water and sewer rates don't cover their rising costs, now that the ever extended pipes are starting to age and fall apart, just as they have done for a while in the City. All three Counties are served by MTA's bus and rail transit system and all three complain about the service and mull over options of running a locally operated system. It is obvious, that only together could they stem a big task like a local transit agency. BGE's gas and electric system is regional and so are Comcast and Verizon's cable services or the mobile phone services of most national carriers. The University of Maryland has facilities in City and County, but community colleges remain split. In all those topics, the entities the local jurisdictions deal with are so much bigger and powerful, that only speaking with one voice can amplify their stand. The Baltimore Metropolitan Council, theoretically the place where the locals coordinate needs to become much more robust to have an effect. Once in a while one can see how crime doesn't know boundaries when Baltimore County police chases criminals deep into the City or vice versa. Yet, the two departments are strictly separate and so is most everything else from schools to parks and recreation. To whose benefit? Of course, the history of redlining and exclusionary zoning which fueled urban flight and created the deep segregation and inequities that characterized City and County for a long time and resulted in the high concentrations of poverty in the City and the lack of affordable housing in the Counties. (Baltimore County doesn't have any public housing) is a volatile topic. But the affordable housing crisis cries out for a regional solution, just as the 2015 regional Opportunity Collaborative had demanded when the Baltimore unrest was still fresh on everybody's mind. listens to Mayor Pugh at a meeting in the City. It doesn't take a rocket scientist to realize, that it doesn't make a lot of sense that services to the people in the region should be segregated in this way, be it education, housing or police, especially if each side produces less and less satisfactory results, sometimes for different reasons: For example, County schools are often overcrowded, City schools close for lack of students. Back in the 1990s Minnesota politician Myron Orfield began to paint future of the "inner ring suburbs" in dire colors with a series of maps. 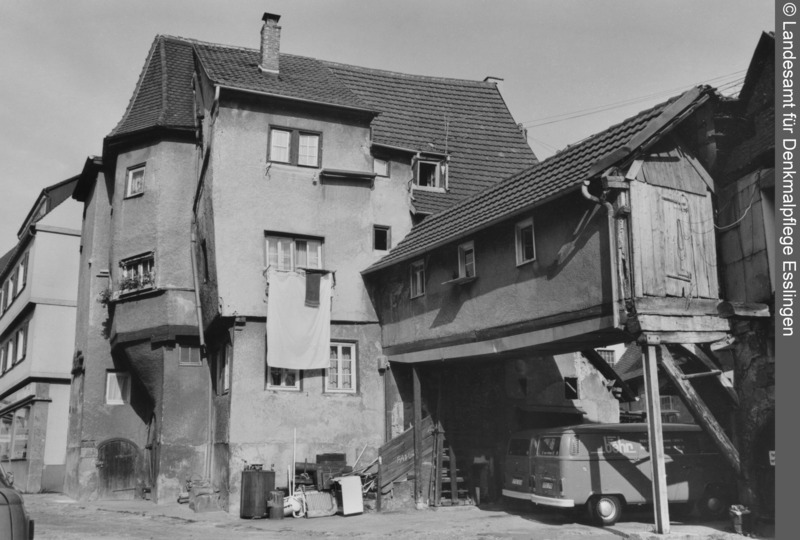 He had been invited by the Citizens Planning and Housing Association, a City activist organization founded right after WW II which looked at housing and began then to study how regional collaboration could help to create more opportunities. Orfield is the guru of regional tax base sharing, invented in the 7-county region of the twin-city region of Minneapolis St Paul where Orfield was a state politician. In that system each of the participants squirrel 40% of the tax gains they get from new development or new companies into a common pot, 60% they keep. The money from the common pot is than being distributed in a regionally controlled manner, accounting for population and needs. By most accounts, this system has been a success, considerably reducing extreme inequities. It presents another solution to collaboration than a full merger. Baltimore City and County should take a closer look at the Abell study, especially at the incremental levels the three sample cities collaborated before they did a complete merge. One key difference is that those cities were all along inside a county, like all major cities in the US, except Baltimore and St Louis, which are euphemistically called "independent cities". Before the full merge the partner which would later merge had different forms of governance, tax rates and forms of representation. 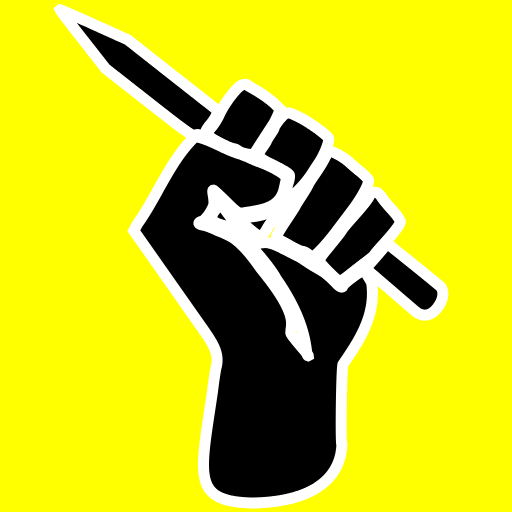 But some shared key functions such as education or police. Just imagine, how much a combined City-County police force would change the current debate about the future of the two individual departments. The time when it was enough for Baltimore County to occasionally send a check to the City for having a great symphony, an opera and all the major museums, is over. In a time where entire metro regions compete globally for educated, young talent, regional pooling, planning and coordination of housing, economic development, sustainability, environmental protection, and transportation is a matter of survival. The time where it was enough to run a Ponzi scheme where Peter would rob Paul to keep the system going doesn't work any longer. Any region needs a healthy core to prosper as a whole. Time for Peter and Paul to join forces, even if it isn't a full merger. For decades Baltimore County grew by leaps and bounds while the City shrank. Finally the County surpassed the City in population. Today the County has about 200,000 more residents than the city, yet its overall General Fund is with just over $2billion only slightly larger than that of the City with $1.88 billion. Much of the County's growth came from the City drawing many of the City's educated and mobile people. But already some 30 years ago some voices warned that the "inner ring suburbs" would face a similar fate to that of the City. Now the time has come where revenue and expenses are on opposite trajectories. The new County Executive told me this morning: "I had no idea it was that bad". In his transition team press conference this morning he mentioned a $81 million shortfall for the coming fiscal year not counting additional money the school system needs. (See the transition team report here). 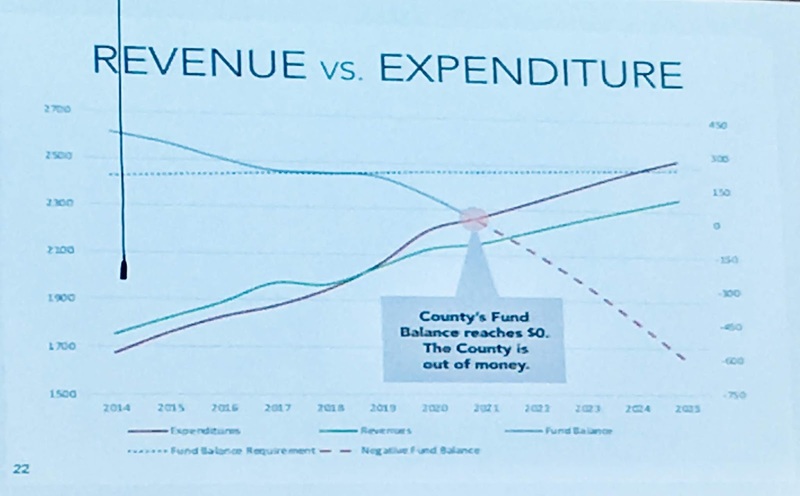 Under ordinary circumstances, the County would curb its future spending commitments to align with such moderate revenue growth [...] For FY 2020 though, the challenges [...] are not ordinary- they are extraordinary- because for far too long, the County has been under-investing in our public schools and in our other needs. Our facilities are literally and symbolically overflowing, as we can [...] see our aging drainage system failing [..] and our children filing in and out of the "learning cottage" trailers encircling our schools. When Dutch Ruppersberger was County Executive and David Fields was Planning Director an office of community conservation was created to pay attention to livability and to make sure that new development on green-fields wouldn't cannibalize the County's older suburbs. Alas, in spite of all the State's smart growth talk, outward growth continued at a rapid clip and Baltimore County, which as the only county in the State, had enacted a real growth boundary, began running out of options for those who looked for affordability via the longer commute. Some call the entire post-war US suburban growth bonanza a Ponzi scheme in which Peter always robbed Paul. It was only a matter of time until Baltimore County would face a fiscal reckoning not unlike the one the City has known for a long time. The writing has been on the wall for years: Most central Maryland counties outperformed Baltimore City and County when it came to household income, increases in property values, educational attainment, job growth and school performance. This are the very same metric which have put the City under pressure for decades and forced the shrinking of Maryland's largest incorporated city. With shrinking incomes, populations and property values came the steady rise of City taxes, until they were almost twice as high as those in the County. For a long time it was enough for the County to have low taxes and "not being the City". The County Executives down the line to Kevin Kamenetz held on to those trademark features by holding property tax rates stable, deferring major investments and by keeping affordable housing largely out of the County. Meanwhile schools aged, infrastructure crumbled and the federal department of housing (HUD) enacted a housing consent decree. An urban renaissance washed the well educated young people back into cities, bypassing the suburbs where their parents lived and which they knew all too well as the place where not much happens. 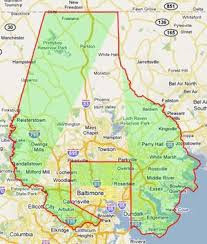 By 2030 more people over the age of 60 will live in Baltimore County than under the age of 18. Any local jurisdiction by law forced to balance its budget faces the question of how to pay for its operations, services and capital projects. In Maryland the main local revenue sources are the income tax and the property tax. That income system works as long as the population either grows or gets richer and as long as growth or rising property values swell property tax revenues. Slowing population growth, lower incomes and low property appreciation all spell trouble, especially when those trends coincide with the time where schools, roads and pipes need their first round of serious maintenance. Baltimore City responded with taxing its shrinking population higher and higher, what will Baltimore County do now it is its turn to face the piper? Not that the County is yet shrinking, but thanks to diminished growth in the key categories, it is showing financial stress nevertheless. There is already a lot of public hand wringing whether it is finally time to raise taxes. "Are tax hikes on the table in Baltimore County"? asks the Baltimore SUN in bold letters. The SUN asked the question again this morning in Olszewski's press conference and the Executive once again stated that "everything is on the table" but that "taxes are the last option". The already noted report by the County's Spending Affordability Committee (SAC) uses unusually frank language describing a County which prided itself for years for its fiscal stewardship. One of the possibilities is to hike the County portion of the income tax which has been held at 2.83% while most more urbanized counties went beyond the 3% mark (the limit is at 3.2% per State law). Another is to charge developers impact fees (as many jurisdictions do) or at least bring back the stormwater fees which had been washed away under Hogan's misleading label as "rain tax". (Stormwater expenses now far exceed collected income). 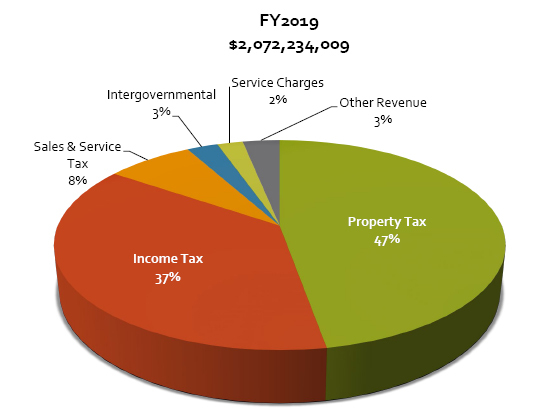 Before going ballistic over the possible prospect of the County raising taxes or fees, it is worth considering that Baltimore County has remained in the bottom portion of combined local property tax rates compared to not only the City but also to high tax outposts such as Princess Anne in Somerset County, Bladensburg and new Carrollton in Prince George's, all at over $1.90 per $100 of assessed value. Not only are the rates comparably low, people in Baltimore County are also not particularly wealthy. 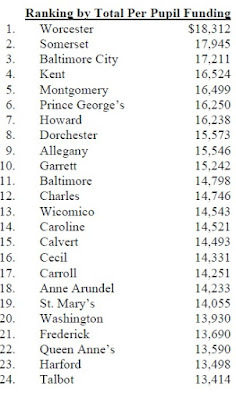 The per capita taxable income of $29,480 ranks far below Montgomery County ($41,270), Howard ($39,221) and also below Talbot, Frederick, Queen Anne's and Calvert Counties. The poverty rate in the County doubled from 1990 to now. Accordingly, County services don't rank in the top either. School funding, the new County Executive's main focus, is relatively low if expressed as per pupil funding. Baltimore County ranks far below Worcester (the leader of the pack), Baltimore City, and below Howard and Prince George's on rank 11 statewide in per pupil spending. 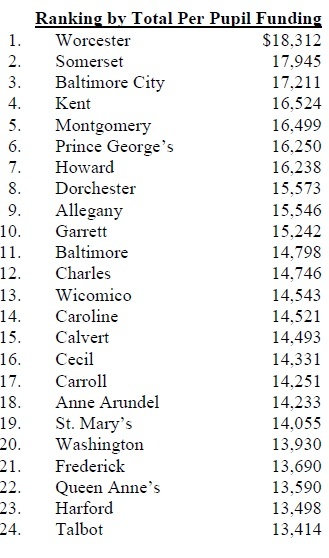 Expressed as total expenditures on education of libraries the County even ranks below Baltimore City on rank 21 of 24. (these and many others rather not so well known facts about Maryland's counties can be found in this document published by the Department of Legislative Services. The current fiscal situation should be an opportunity for the County to re-position itself in the metro region. In a time of urban renaissance and young adults flocking back to the City because they rediscovered human interaction and the beauty of well designed public spaces and parks, in a trend that favors experience over consumption and favors quality over quantity. Defining oneself as "not the city" is clearly no longer sufficient. While there will always be people who prefer the quiet anonymity of a suburban home over the hustle and bustle of a city, the trends go in the other direction. 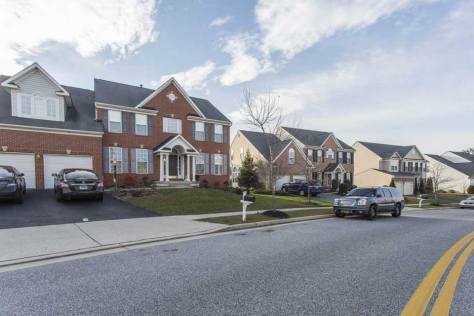 Baltimore County's most authentic communities such as Pikesville, Essex, Arbutus, Dundalk and Catonsville hold the promise to attract people who care for community character. But those communities are aging, suffer from failing infrastructures and schools in need of repair and haven't seen the amount of attention they need. Its historic district rules are weak. Gritty, creative and innovative reuse of old factories such as the American Can, Tide Point or Clipper Mill is still elusive in all of Baltimore County. The impressive reincarnation of the former Segram whiskey facility by British beer giant Guinness on a 62-acre campus Baltimore County is an interesting start, but it doesn't support local business and remains entirely isolated. Only slowly, and without County goverment's doing, does the County offer the brewpubs, bakeries, bikeshops and events millennials like. The County yet has to designate an arts and entertainment district. The County's anchor institutions such as Towson University and UM at Baltimore County remain isolated and do little to revitalize their neighboring village and town centers. Transit is largely absent, Baltimore County is one of the few large Maryland counties which does not run its own transit system and relies entirely on MTA. Attempts of new urbanism or transit oriented development are woefully inadequate compared to what the Washington suburbs have done. The newly elected County Executive Johnny Olszewski has started office with a lot of promise, energy and openness. His has rightly embraced regional collaboration and addressed most of the noted shortcomings in his campaign. He himself says that the problems of Central Maryland do not know jurisdictional boundaries, whether it is transportation, water, sewer, trash or bad air. The counties around Baltimore City won't succeed if they continue the bad politics of the past in which each competes against the other and all together against the City. It will take courage to favor investment over austerity, but that is exactly what the County needs to reverse the downward trajectory of its revenue and the upward course of expenses. The author was a member of the transition team on the committee for Sustainability, Infrastructure and Transportation. This is the second of two articles about the most recent meeting of the CHAP Commission. 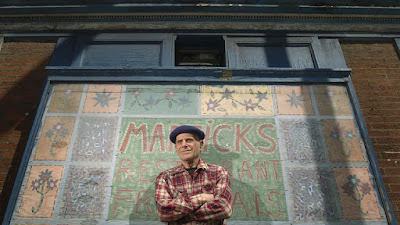 Having tabled the decision about the Martick's building at 214 West Mulberry Street, the Commission went on to deliberate about the proposal by building owner Howard Chambers to tear down the backs of four carriage houses on Morton Street in Mount Vernon, preserve the fronts and build a six story "addition in the back across all building lots. 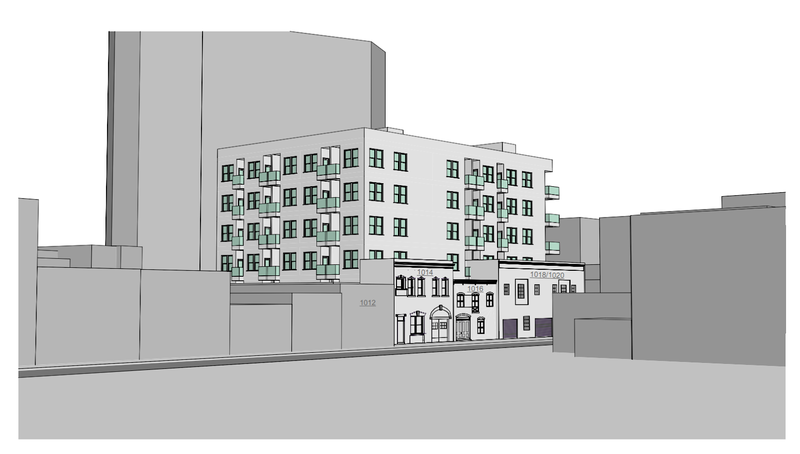 The staff recommendation was for CHAP to ask for a modification of the proposal to retain more than 15' of the front of the buildings and then revisit the matter. But the verdict of the Commission was harder than expected. 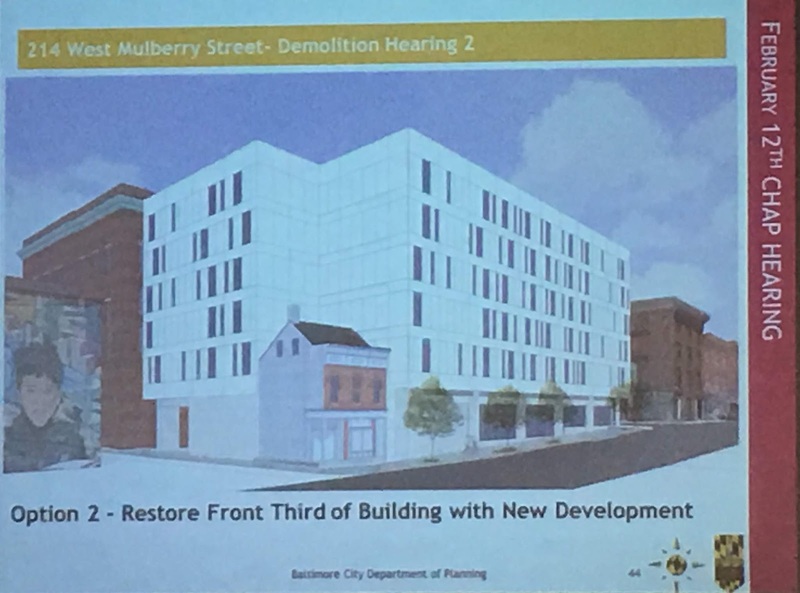 Last year the Commission approved the demolition of historic buildings on nearby Eager Street to make way for a new highrise without keeping any part of those buildings. 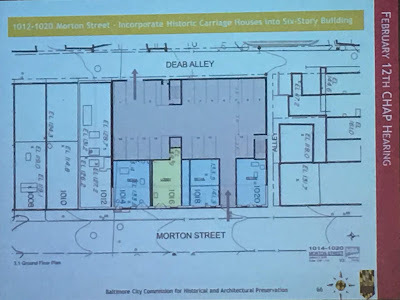 Also a 2006 proposal for demolition of the same carriage houses had support from then Mayor Martin O'Malley, and then planning director Otis Rolley III on the grounds that new construction would enhance the tax-base and get more people on the streets of Mount Vernon. 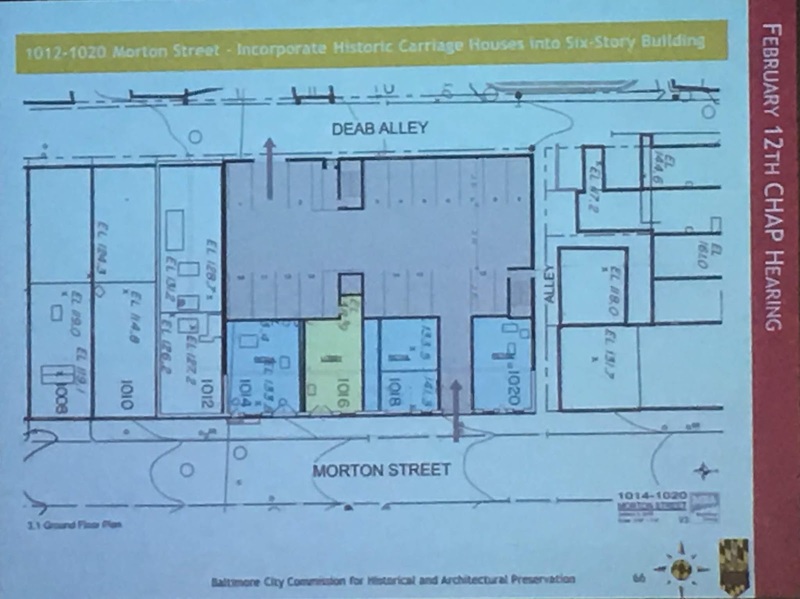 Indeed, CHAP had seen the Morton Street carriage houses many times before, Commissioners and staff have changed but the applicant has stayed the same since 2001. 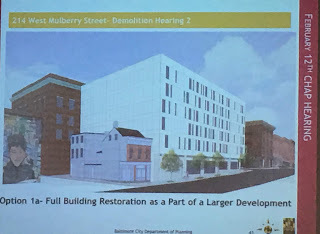 Some applications dealt with rehab proposals, one with full demolition but was eventually pulled, so was a proposal much like the one now which suggested to keep three fronts and tear one carriage house down for a new building. The concept received a pretty positive review in 2006 but no final vote. However, Chambers never followed through with those plans. 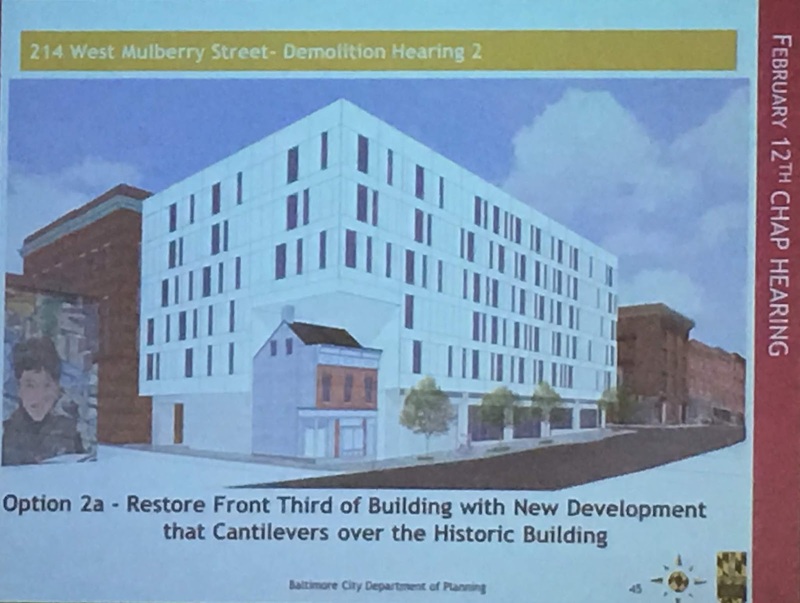 The somewhat erratic history may not have helped, nor did the fact that the project was now submitted as an "addition" and not as "demolition", a point that created much debate and some uncertainty how to proceed. Changing course would have meant that the matter would have to start over in a two step process in which the first point of consideration would be if the buildings are significant in this local historic district. This is what Johns Hopkins of BalTimor’s Heritage asked for in his testimony and this is what the applicant could have settled with. It would have kept the door open a bit longer. The plaintive tone of Howard Chambers did little to sway the commission in his favor. "People I talk to say “do something with the parking lot [across from his proposed project] before you tear anything down, but I don't control that lot" he started his testimony, arguing a point the Commission would never make. He then argued economics and how hard it is to rent out those carriage houses (an economic hardship argument, while allowed under CHAP rules is centered around a demolition and not an addition, and finally complained that "nothing happens in Mount Vernon", a point that CHAP isn't responsible for, especially since they had just permitted the new apartment tower south of Eager Street, certainly a major project. It also didn't help that the architect, Chris Pfaeffle of Morris Ritchie Associates made a more philosophical than technical plea. In it rang not so subtly the suggestion that Baltimore is too provincial to understand how preservation is understood elsewhere as a dynamic continuum instead of "static and dead as in taxidermy". He described the proposed project as "a strategic work of design [where] you can walk into the cool old building to get to the cool new building above.” This is not the language preservationists find convincing. 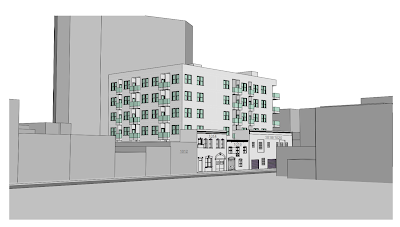 For an argument to be tailored to CHAP's standards one would talk about what historic significance the backs have or don't have, or how the proposed "addition" really does not turn the remaining fronts into the tails of a big new dog. Some explanation about how the main features of the carriage houses would be integrated and emphasized would have helped, too. Even better if they had convinced the Mt Vernon Improvement Association about the benefits of their project. ((They spoke against it). Alas, as it was, the team left the floor wide open for the Commissioners and the testimonials which were mostly negative. Applicants do better if they don't come in as adversaries but as partners who understand that CHAP does an important job. After all, Baltimore's biggest asset is a rich treasure trove of historic buildings, both, "high brow" and "low brow". Preservation has long become an element of the culture wars, of social identity and, importantly, of economic development. A national study shows that preservation areas in all cities perform far better than those where bulldozers reign unfettered. The owners and developers of these two projects I described seemed to not fully get the all important context. But each case before the Commission could be another lesson for those projects yet to come. On a wet and cold February day what was going on catty corner from City Hall in the windowless Phoebe Stanton room on the 8th floor of the tired Benton Building provided another great lesson in the many ways historic preservation can be misunderstood. Still, even 56 years after Penn Station in New York was demolished, an event that is usually cited as the birthplace of American historic preservation. The occasion was a meeting of the Baltimore City Commission for Historic Preservation (CHAP) and small historic structures threatened to be swallowed by development proposals for contemporary apartment buildings. 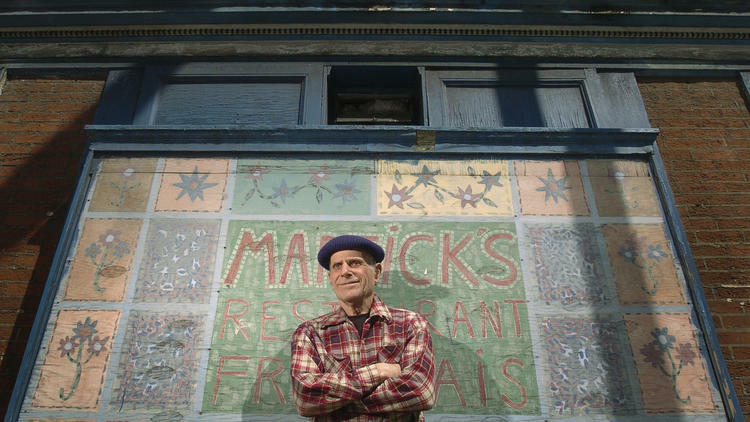 First on the agenda was Martick's, a tiny two story building on Mulberry Street that has been boarded ever since Morris Martik left the stove of his Restaurant Francais cold in 2008 after a run of nearly four decades. 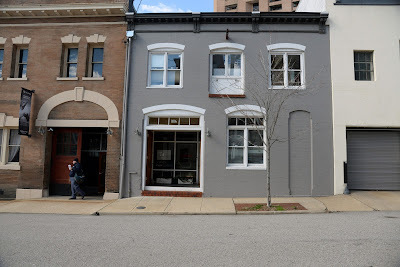 One can argue for the historic stature of this building on the ground of its architecture: The vaguely Federal style building dates back to somewhere between 1830 and 1850, making it one of a few Baltimore pre-Civil War buildings. 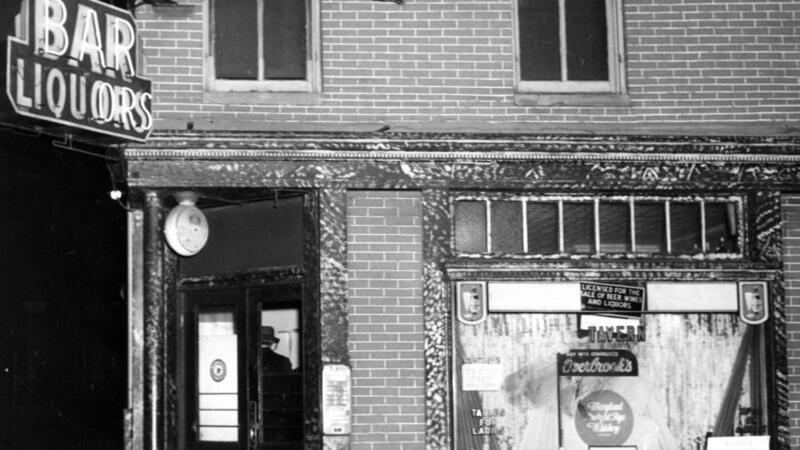 Or one can argue historic relevance because it is dear to a whole generation of older Baltimoreans who frequented Martick's Tavern as artists or bohemians. Initially run by Morris' father since 1917 (he served jail time for selling booze during prohibition) or later later to enjoy French cuisine prepared upstairs by Morris who had learned to cook that way after he had, , locked the Tavern up to go to France, frustrated by the "artist alcoholics" as he apparently called the folks hanging out in his place for endless hours. 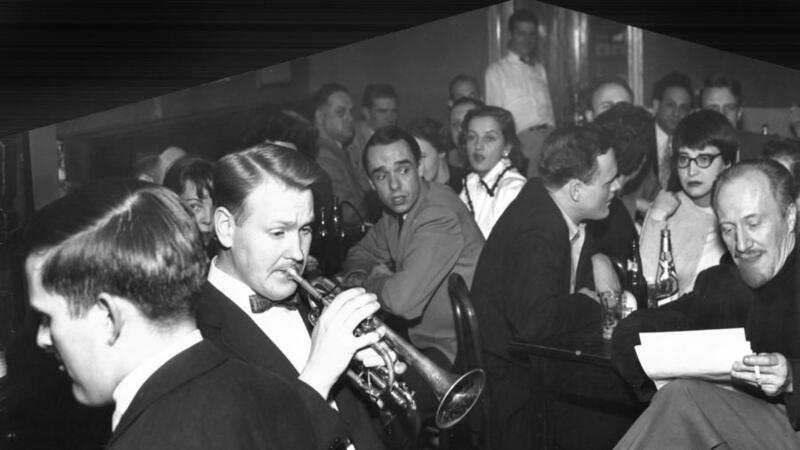 Those more elaborate French dishes he cooked upon his return were still a revelation back in 1971 when he reopened the old abode on 214 West Mulberry Street in which he had been born in 1923 and in which he lived to his death in 2011. 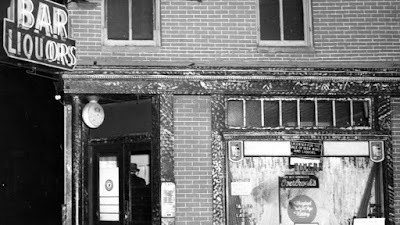 (More detail in Baltimore Heritage's blog). In January CHAP sided with both of those arguments for historic relevance and unanimously recognized the building as historically significant (it sits inside the Market Center National Register District), forcing the developer, who wants the building gone, to come back with a an application for demolition based on "financial hardship". The CHAP commission starts their deliberation off with a staff report. The recommendation: Table the decision since the financial report provided by the applicant, doesn't include potential cost breaks from grants and historic tax credits. 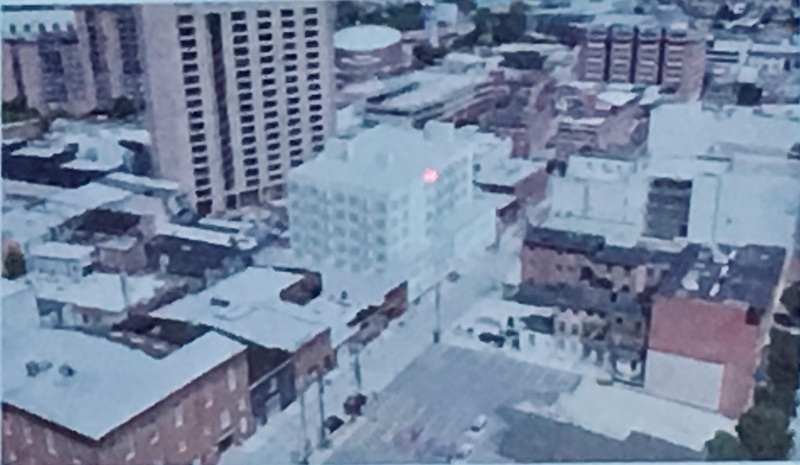 In yesterdays session the developer, Chris Janian, president of Vituvius Development, presented various scenarios which more or less gobbled up the old structure and showed one with the building fully gone. Their conclusion: All cases, except the full demolition, present a financial hardship, because the developer can't recover the stated $1.1. million rehab cost with a reasonable return on investment (CHAP allows 8% as a threshold after 5 years). The developers admitted that their proposed six story apartment building wasn't designed yet and that the images were just "massing" sketches, but all images made whatever was left of 214 West Mulberry, look ridiculous, especially since the architect (Quinn Evans Architects) maintained that no windows could be placed in the west facade of the six story apartment block towering over the small old building. Then the commissioners asked a few questions. Commissioner Larry Gibson was especially interested in the Chinatown aspects of the development where it faces Park Avenue. (The developer assured that he likes Chinatown and promised to preserve the 5 buildings facing Park Avenue. 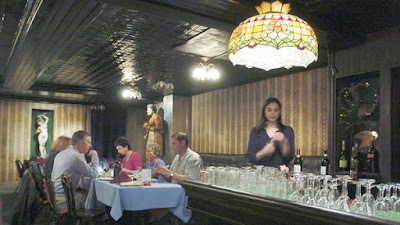 Jim Rouse who had worked for Martick as a waiter from 1974-81 gave a colorful rapport of the life inside the shabby building in which the French food (specialty: bouillabaisse) was served in near total darkness. Naturally, he spoke in opposition of demolition. Councilman Eric Costello and Market Center Merchant Association Director Kristen Mitchell spoke for demolition, probably because the owner asked them to, at any rate, they didn't provide any particular reasons for their position other than convenience for the developer. Johns Hopkins of Baltimore Heritage spoke succinctly for a delay in the vote since the materials had not been made sufficiently public. So what are the misunderstandings? 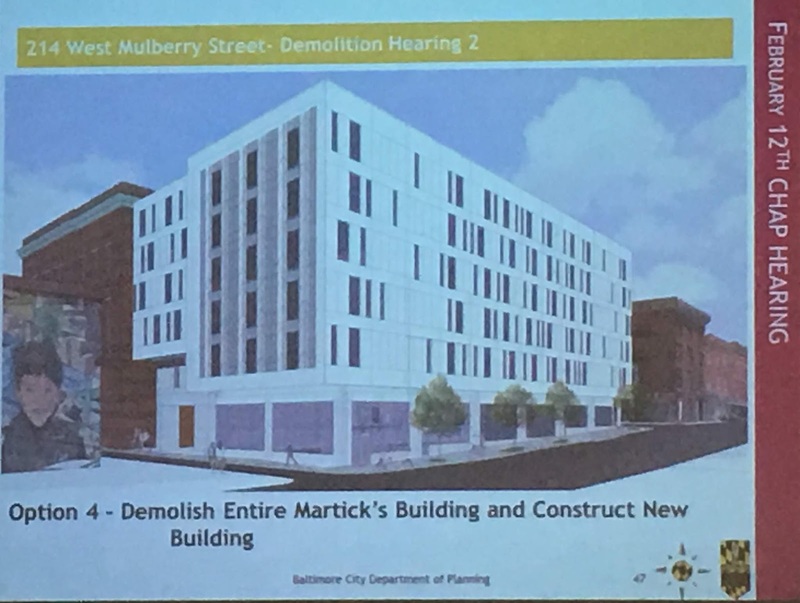 The first comes from the developer who had responded to a BDC request for proposals to develop almost the entire block, but the RFP excluded the Martick's building. The developer then purchased the derilict Martick's in Decemberfor $100,000. One would think, that buying a 170 year old building in a registered historic district should come with an understanding that preservation may be required. But Mr Janian had another goal. 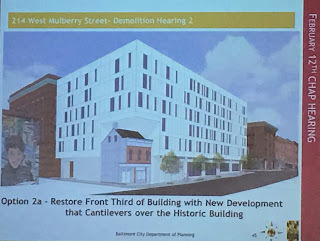 Later at the CHAP hearing, in the second case of a developer wanting to (partially)tear down historic buildings, the owner of the Baby's on Fire record store suggested reasonably: "If you buy a historic building, don't count on demolition". Other misunderstandings came from the architect and the structural engineer. 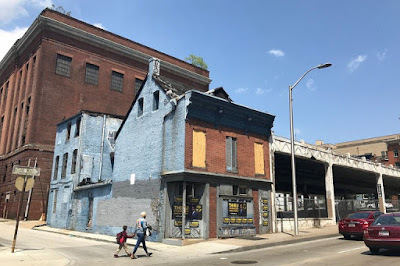 The latter emphasized the poor condition of the structure, not something one can hold against the historic building, rather against those who let it go after it closed in 2008. ("Demolition by neglect"). The architect made no effort of showing how the much larger new structure could be a good neighbor to the old relic. He could have shown a few convincing precedents from other cities where such in-congruent adjacencies have been done with success and respect. Lack of respect can kill a historic building, too. Then those who testified for demolition, because they are afraid the developer would run away from this very difficult block. A misunderstanding, too. True, the Market Center District can't afford to lose anyone who wants to invest there, especially in a very difficult block like this. But aside from presenting a very inflated cost of $1.1 million for the rehabilitation of less than 3000 sqft, the tiny building could hardly be a game changer in the $30 plus million deal, especially before all possible funding, use and support scenarios have been properly played out. The biggest misunderstanding is that historic preservation is just a costly drag and impediment to new development. What matters much more than the added initial cost, is the value a preserved historic building adds to the development. Baltimore with its stagnant population and not exactly stellar reputation needs more than a sleek new apartment building to attract people to move here, especially right next to Mulberry Street with its three lanes of incessant traffic. What could be a better accessory and branding tool than a building that is older than most anything in the suburbs? Better than a building with such a storied history of uses, attractive to any any age? Elsewhere they have to insert second hand antique beams and barn-doors to create the bit of "experience" and "authenticity" people are longing for. To look at the sad condition of the current structure and conclude that it should better go, proves nothing but a lack of creativity, imagination and inspiration. Fix the thing up and nobody will ever suggest again that it should have been torn down. 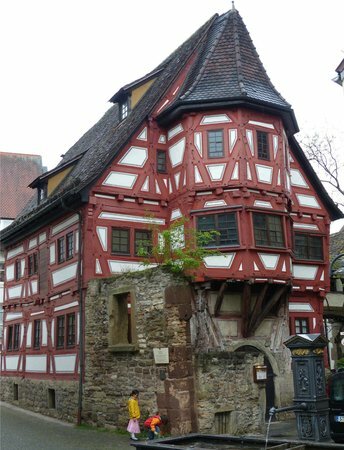 I have seen this before: A few years after Penn Station had been demolished, I fought to preserve a 15th century old religious "cloister" in Stuttgart and thus learned to understand the value of preservation. A small group of dedicated people saved the dumpy HVAC shop that was slated for demolition for a department store. Today, shiny department stores are long obsolete, but the fixed up "cloister", in its reincarnation as a wine bar, is the pride of the town. Part 2 will deal with the Morton Street carriage houses. 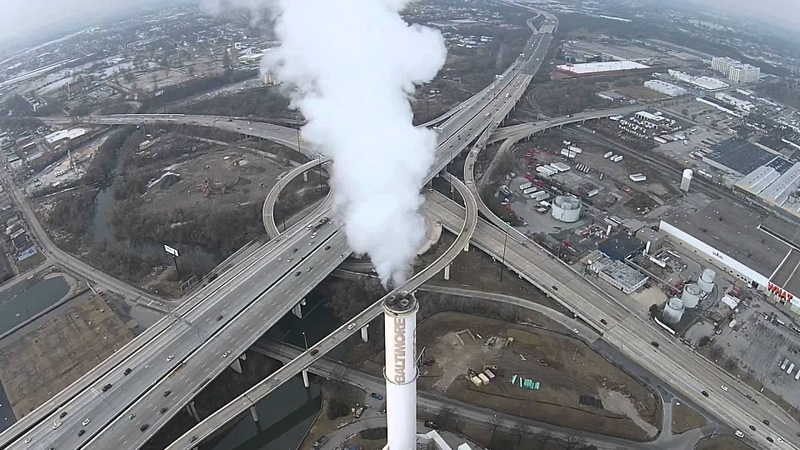 City Council Bill 18-0306, Clean Air Regulation will impose stricter emissions standards on commercial solid waste incinerators in Baltimore City. The bill is up for a final vote today. The stakes are high, not only for the BRESCO incinerator and its operator Wheelabrator, but for the entire region since the incinerator may have to shut down as early as 2021 if the new clean air standards go into effect. (This is the year when the current City contract with Wheelabrator expires). The battles lines are typical for environmental legislation: industry versus environmentalists, economic arguments against those that address social justice, equity and health and, of course, legal questions whether the City has the authority to legislate clean air standards. City Council Bill 18-0306. (The document can be found here). The impact analysis is limited, though, it is prepared by the Department of Public Works (DPW) and not by an independent agency and it does not include any specific recommendations about how the City can achieve further waste reduction. The "fiscal note is limited to assessing the impact of several BRESCO scenarios on the scope of our current waste stream and disposal means" DPW admits. Several scenarios were developed costing the city money for lost income from BRESCO (a loss totaling $9.8 million per year should it shut down), and lost tipping fees from commercial haulers at the City landfill who would have to find disposal outside the city. 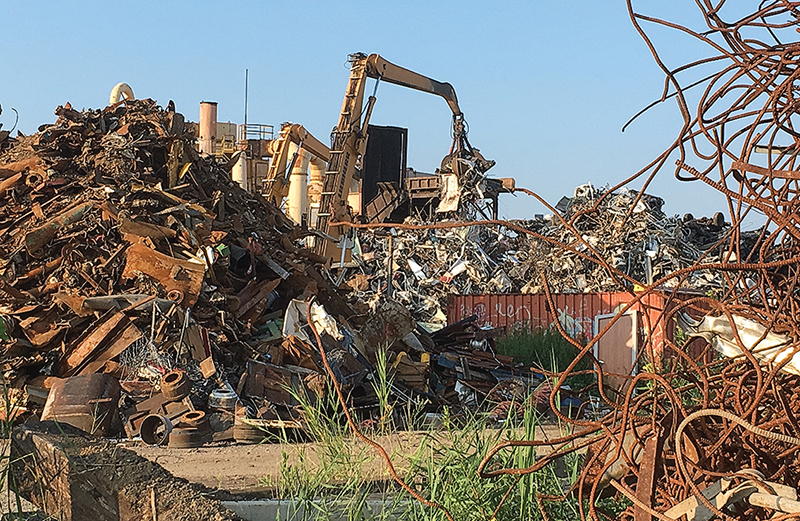 If the City would dispose all its solid waste in its own landfill, the cost would be about $12.8 million per year or $98.6 million over seven years. The landfill would reach capacity in 2024 instead of 2026, not assuming the planned capacity expansion expected to be completed by 2026 or later. If the City would dispose its waste gradually outside the city limits via an additional transfer station (cost about $10 million) to be constructed, the annual cost is given with $15.8 million, a number with lots of uncertainty, since no negotiations have been had which landfills in the region would accept all the City's trash. the district heating customers and the Trident facility which use steam from the incinerator to heat downtown properties (they can also use natural gas supplied by BGE but at a different cost). 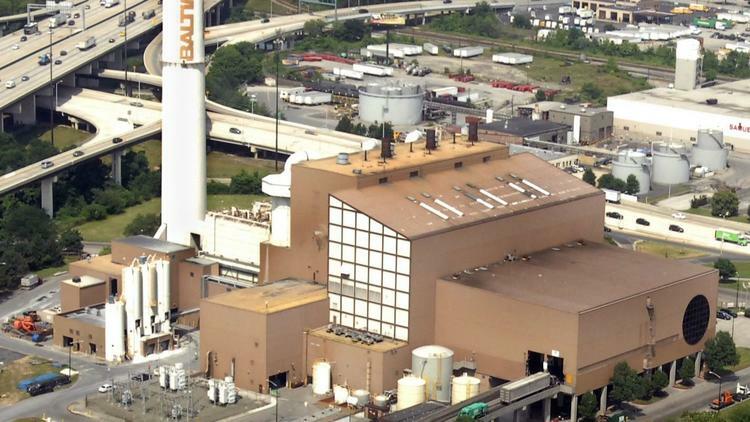 One of the less reported aspects of the incinerator is that it received in 2018 more solid waste from Baltimore County than from Baltimore City. The split was 159,000 tons (City) and 215,000 tons (County), according to Mira Green, a Senior Budget Management Analyst at City of Baltimore. This makes the question of the incinerator a truly regional matter. 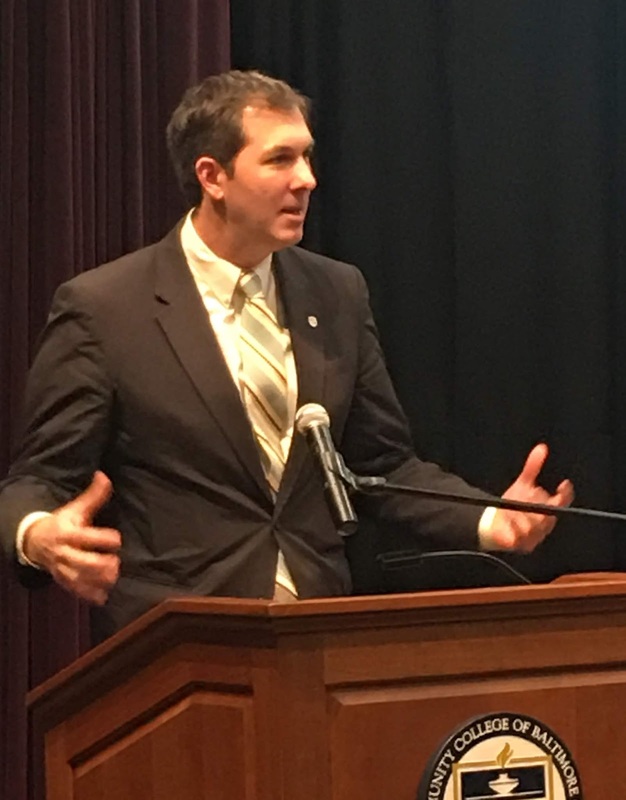 No comment was available from the new Baltimore Executive Johnny Olszewski who has stressed regional collaboration and partnership with the City. Commercial haulers who service businesses and larger rental and condo complexes in the City and the County deliver also solid waste to the BRESCO plant, creating tipping fees for the City. Also not much reported is the fact that only 51% of DPW collected waste goes to the incinerator, in spite of the City's dismal 15% recycling rate. There is no immediate explanation why currently a large portion of waste would be directly landfilled. Wheelabrator's arguments aim at the emissions from additional trucking and landfilling, notably diesel fumes (NOx) and methane and the fact that landfilling isn't a green method of waste disposal either. However, these additional emissions the clean air bill may cause, though bad for greenhouse gases, are not in the same league as the highly toxic emissions from the smokestack of the incinerator and from the ash disposed in the landfill. Proponents of the Clean Air bill count as costs of incineration the poor health outcomes from bad air, such as asthma. Such "external costs" are not part of the cost evaluation prepared by DPW. Currently, the majority of waste collected within Baltimore City is sent to BRESCO for disposal. If this facility were no longer an option, then the City would need to find an alternative waste disposal method due to the limited capacity available at the City-owned landfill. 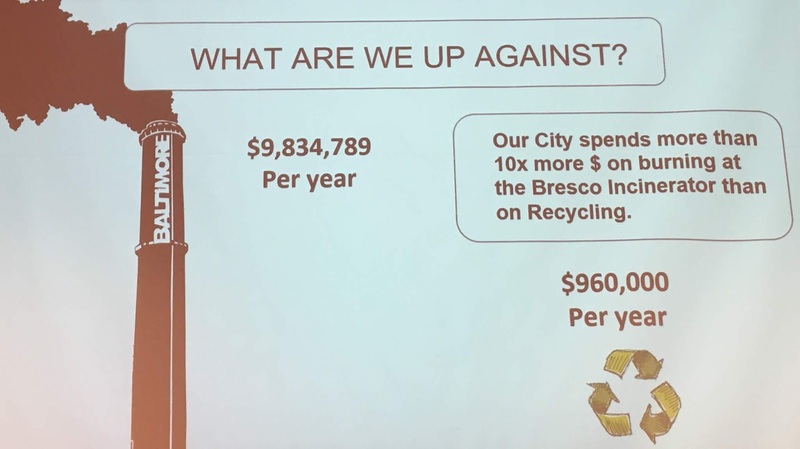 The landfill is currently projected to have capacity until 2026, but the closure of BRESCO will increase landfill usage by possibly 100% a year. The City would lose approximately $10 million a year in payments from BRESCO and $4.5-5 million in tipping fee revenue. There would be necessary expenditures of at least $10 million for a new transfer station, operating expenses of approximately $2.2 million a year for the transfer station, increased operating costs at the landfill, and transportation and tipping fees to an outside landfill, which could range from $10-22 million depending on which landfill is willing and able to accept the waste and how much they would charge. The Baltimore metropolitan area has been a non attainment area under the Clean Air Act for decades. This article is an adjunct to Friday's article about the same topic. 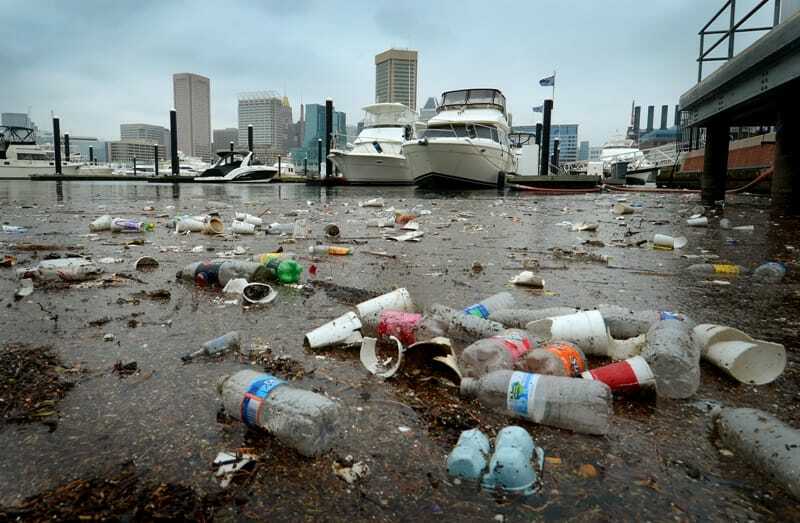 Baltimore City drowns in trash. Trash is a perennial favorite topic in Baltimore with a general consensus that the city is especially trashy compared to others, one of several things that sets us unfavorably apart. But the latest round of trash debate elevates the matter to an all new level. To 1.2 million annual tons level of trash, to be exact, and that is only the official count! At stake is where this trash should go. About 700,000 tons of waste (2011) go to the incinerator Baltimoreans know as the BRESCO plant, conveniently located at I-95 and The Baltimore Washington Parkway, right next to Baltimore's casino and Greyhound bus station. The plant is featuring a big smokestack that says "Baltimore", a gateway symbol of sorts. Zero waste and anti incinerator activist Destiny Watford calls it the "worst idea of a welcome sign". The incinerator is the single largest point source polluter in the City, responsible for an estimated 1/3 of all City air pollution including extreme toxins such as dioxin and mercury. The waste incineration concept also plays out at the Curtis Bay Energy operated nationally largest medical waste incinerator which is permitted for 62,000 tons of medical waste a year, but usually accepts less than half of that. 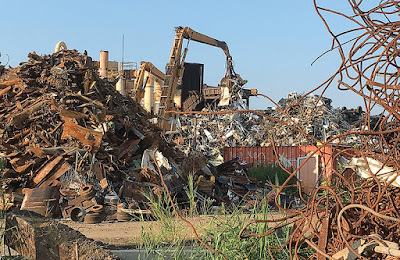 The Mayor, Baltimore City Council and DPW have no solutions in hand for the triple challenge, even though the clock is ticking loudly given the relatively close end of usable life for the incinerator and the landfill. There is the mandatory 10 year waste management plan, but it doesn't provide a clear path forward. 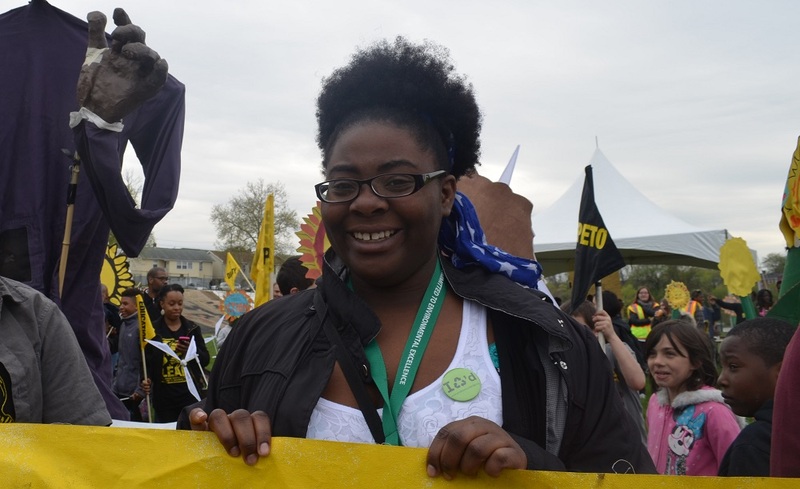 The Sierra Club believes that Maryland shoots commit to a rapid transition away from fossil fuels (coal, oil, and gas) and other carbon intensive sources of energy, and towards clean renewable energy. This starts with setting strong goals and aligning incentives to work towards these goals. The state of Maryland should not be incentivizing trash incineration. Everyone knows the saying "reduce, reuse, recycle" but we often skip the first two steps. Communities that have been most successful in waste reduction focus on all three elements (Tulkin). The matter came to a head this week when Council passed the second reader of the Clean Air Act this week and voted to drastically increase the clean air requirements for incinerators, specifically by limiting the limits for mercury, sulfur dioxide, dioxins and nitrogen-oxides. The 2021 deadline for compliance had been removed in this round of the bill. The legislation will be up for another reader. 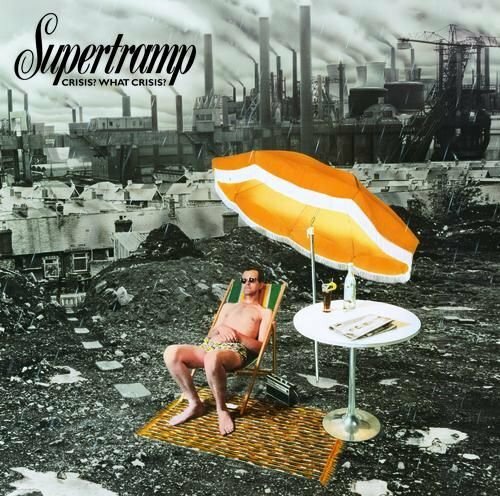 Living on a dump: Supertramp Album cover. The Council also adopted a Resolution to remove the incentives the incinerator receives for "renewable energy" by eliminating trash incineration as an accepted renewable energy source. The resolution is tracking a similar bill in the State legislature. The Clean Air Baltimore campaign and the proponents of the bill argue that Baltimore is not only in non-compliance with the federal Clean Air Act but has some of the worst air in the nation. To clean up the air, the Council set emission standards which match the strictest standards for sulfur dioxide (SO2, 18 ppm/VD) and mercury (15 micrograms/cbm) in effect in North America in 2020, match North America’s strictest standards for dioxins (2.6 nanograms/cbm) and nitrogen oxides (NOx, 45ppm/VD) by 2022 and match the NOx standard met by the newest incinerator in the U.S., in West Palm Beach, Florida. This is also the same standard as the Maryland Department of the Environment required for the Wheelabrator facility once proposed in Frederick, MD which was defeated by local opposition in 2014. The mercury, dioxin and SO2 standards match those of the newest trash incinerator in Canada at the Durham-York Energy Center in Ontario. (per Clean Air website). The emission limits appear to be significantly lower than those allowed by EPA, especially for NOx and mercury. The value for dioxins/furans given in the City bill may be incorrect since it appears to be about six times that on the EPA table pg 129). 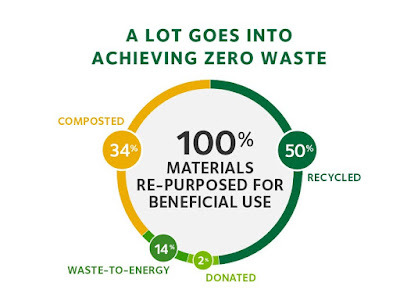 Zero Waste graphic by "Waste Management"
The clean air activists describe "Zero Waste" policies as the alternative to incineration and landfilling. A Zero Waste policy has been adopted by many cities, including by the New York City Boroughs which closed the Freshkills landfill to create a park. In the meantime, though, the Boroughs ship waste on barges to North Carolina at a cost of $300 million per year, hardly a sustainable practice. A study for Baltimore estimated the immediate cost of closing the incinerator for Baltimore to be $136 million over four years. (SUN). 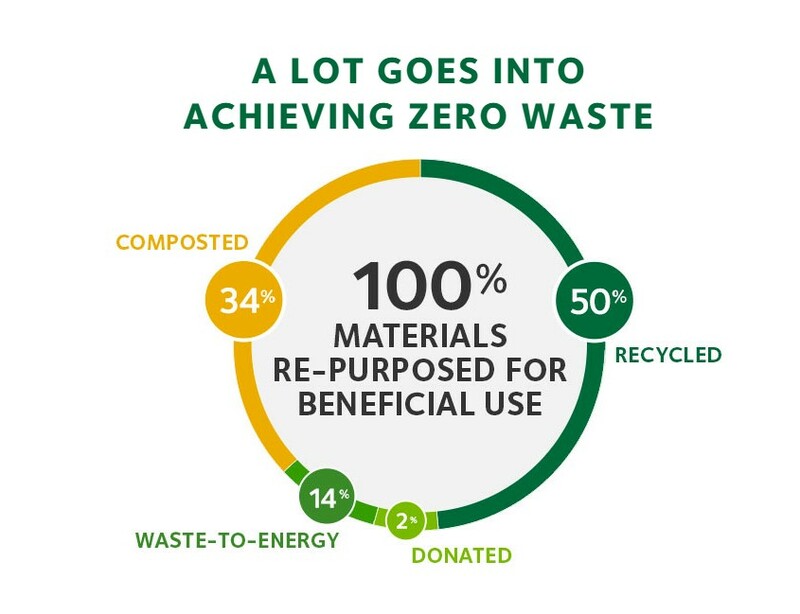 By using local, post-recycled waste as fuel to create a local energy ecosystem, the facility diverts waste from landfills and lowers greenhouse gases by recycling metals, offsetting the use of fossil fuels and reducing methane gas emissions from landfills. Wheelabrator [...] provide[s] as much as 52 net megawatts of clean, renewable baseload energy for sale to the local utility after meeting its own power demands. That is enough electricity to power 38,000 Maryland homes. Wheelabrator Baltimore delivers “green steam” to the downtown district energy system operated by Veolia North America— which serves more than 255 businesses including M&T Bank Stadium. National recycling rates hover around 30%, Baltimore is at about half of that. single stream recycling has been widely adopted in the US and has led to China closing its borders to US recycling shipments due to unacceptable contamination. After China dropped out of the recycling loop, even places with much more stringent recycling practices, such as Germany, had to find out that far more than half of their recycled waste still winds up in incinerators, landfills or foreign storage, dimming any hopes to drive waste production anywhere near zero. Climate change, the growing dangers from plastic in our environment, and the continued health challenges from bad air in metropolitan areas force a drastic new course of action, unless one wants to ignore those ticking time bombs jeopardizing the future of our children. Still, well intended bills won't do the trick, unless there is a clear path towards how the desirable outcomes can realistically be achieved. The adopted Baltimore City styrofoam ban now being considered statewide as part of this years legislative agenda in Annapolis is a good start, but much more has to happen on the waste reduction side before emissions on the waste management side can be effectively driven down. Mira Green, Senior Budget Management Analyst at City of Baltimore clarified via Facebook: In 2011 BRESCO received 415,000 tons of trash from the City and 285,000 tons from the County, both numbers include trash collected from households and commercial trash. Last year the City of Baltimore was billed for 159,000 tons of household trash collected by DPW, the County for 215,000 tons. This low City number suggests that the total City solid waste volume was potentially lower than in 2011 and that a substantial amount of waste comes from commercial haulers. It is also worth noting, that more waste came from the County than the City. The decision about the future of incineration, therefore, has truly regional consequences. Wheelabrator has ramped up its propaganda against the Baltimore Clean Air Act in light of the final Council vote on Tuesday 2/12/19. Councilman Zeke Cohen alleges that the We can B'more campaign started by the incinerator operator violates the Transparency in Lobby Act. (Video). He clarifies that the Incinerator wouldn't have to close down immediately upon passage of the bill but in 2021. What is going on with Port Covington?